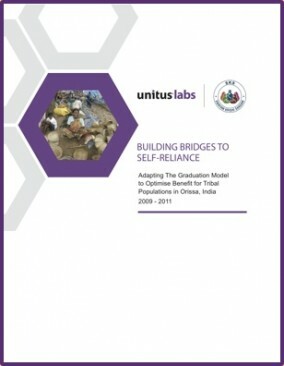 Unitus Labs publishes new in-depth case study report on SKS NGO ultra poor program in Orissa, India. Report describes new tools developed to overcome physical, cultural obstacles of working with isolated ultra poor communities. Looking beyond progress made during an ultra poor intervention, the success of an ultra poor program must also be judged by beneficiaries’ ability to sustain progress made after the intervention has ended. Seeing this challenge and recognizing the opportunity to reach new communities in need, SKS NGO joined the Sorenson-Unitus Ultra Poor Initiative (UPI) to work with some of India’s most isolated ultra poor communities and ensure that the gains made by beneficiaries continue long after the end of the two year program. Working with the isolated tribal communities of the eastern state of Orissa – one of India’s poorest states — the SKS NGO team had to devise mechanisms to train its members to be 100% self-sufficient after the program’s conclusion. Augmenting the traditional graduation model, the team focused on neutralizing the most common shocks to rural communities by developing self-managed tools for the community members themselves to provide their own food, health, and financial safety nets. With regards to effecting self-sufficiency, the pilot was a success. Not only did 850 of the 887 participants graduate from the program, but they did so with food banks in place for emergencies, primary health workers to diagnose and treat common ailments, an understanding of financial management with access to a bank account and loans, individual savings of as much as Rs 10,000 (US $200) per beneficiary, and a set of skills and means to generate additional income.